Digital innovative technologies have enabled organisations to create opportunities to support their competitive advantage. In this regard, realising the dynamics influencing the adoption of these technologies becomes critical to their success. While much attention has been focused on the technological development, implementation and employees’ adoption, little has been done to examine the specifics of digital innovation influencing technology uptake in organisations. Drawing from Technology Organisation and Environment framework, this paper examines the factors affecting innovation dynamics adoption in the context of cloud computing for SMEs. The findings obtained from IT and senior managers highlight that while innovative IT capabilities, organisational innovativeness, perceived innovation risk, perceived innovation barriers influence the likelihood for SMEs adopting cloud computing as an innovative solution, IT innovation-driven competitiveness has limited influence. As such, this demonstrates how understating the specifics of innovation dynamics can help in offering the required support for SMEs in sustaining success. Innovation through technology in organisations has always been viewed as a strategic vehicle deriving effective business processes to further nurture their competitive advantage (Mckeen and Smith 2003; Smith et al. 2007; Nguyen et al. 2015). However, maintaining a consistent and coherent strategy in utilising technology as a source of innovation has often been restricted to larger organisations, and small and medium businesses have been laggard mainly due to affordability and access. In recent times, digitally innovative technologies such as cloud computing have emerged as a viable platform that has the potential to reverse this trend (Loukis et al. 2019; Senyo et al. 2018; Karunagaran et al. 2017; Sabi et al. 2017; Wang et al. 2016; Rittinghouse and Ransome 2010). In particular, cloud computing services can offer smaller businesses access to Information and Communication Technology (ICT) resources, including both hardware and software that were hitherto not affordable by SMEs. As such, it has the potential to minimise any strategic disadvantage that SMEs have had in terms of their ability to use ICT for ensuring internal operational efficiency and cost savings and external customer related processes. Therefore, from a commercial perspective, this innovative environment enabled by ICTs offers SMEs the opportunity to compete with larger organisations on a more even keel. The exponential growth of cloud computing providers and the year-on-year increase of adoption by organisations can be seen as a paradigm shift, making cloud computing a topic of great interest to industries and academics alike (Etro 2009; Kevany 2010; Sultan 2011; Bayramusta and Nasir 2016; Wang et al. 2016; Senyo et al. 2018). Nonetheless, many organisations, including SMEs, are yet to fully appreciate such offerings individually as a unique tool for deriving innovation. In this respect, organisational innovation dynamics, which are related to how organisations can be susceptible and open towards innovation, can have an impact on adopting new innovation-driven technologies, and this requires an in-depth assessment to uncover what exactly is affecting organisations from adopting cloud computing as a mainstream innovative technology. While there have been several studies that have explored technology adoption in SMEs (Grandon and Pearson 2004; Ray and Ray 2006; Bruque and Moyano 2007; Marasini et al. 2008; Wu and Lederer 2009; Lopez-Nicolas and Soto-Acosta 2010; Weiyin et al. 2011; Mehrtens et al. 2001), little was offered on examining how innovation dynamics can influence the adoption of innovative technologies (Jahanmira and Cavadas 2018; Senyo et al. 2018; Wang et al. 2016; Salavou et al. 2004). In this respect, SMEs often face the challenge of managing existing resources including infrastructure and skills and associated expertise in order to maintain the required adoption levels for the ICT enabled innovations. (Thong and Yap 1995; Subramanian and Nilakanta 1996). Furthermore, from the organisation point of view, investing in new innovative technology can contribute towards creating some unique complexities and risks for organisations (Smith et al. 2007). Hence, organisations, including SMEs, will be required to maintain an efficient approach towards the adoption of innovative technologies (Loukis et al. 2019; Karunagaran et al. 2017; Hyytinen et al. 2015). This dilemma is, therefore, the basis and motivation for the present research. For cloud computing technologies, studies examining the factors influencing its adoption were emphasising on the specifics of the technology itself instead examining associated innovation settings (Martins et al. 2015; Amiri 2016; Benlian et al. 2009). Furthermore, technology–organisation–environment (TOE) framework (Tornatzky & Fleischer 1990) has been utilised generally as a lens to examine technology adoption (Sabi et al. 2017; Zhu et al. 2006a, 2006b; Yang et al. 2015). Nonetheless, it was quite evident from the extant literature that there has been limited attempts in exploring the role of innovation dynamics in facilitating the adoption of innovative technologies in organisations through TOE lens. Given this context, the purpose of this study is to investigate innovation dynamics related to organisational adoption determinants as in cloud computing in SMEs through the TOE framework lens. In order to realise the aim of this study, this paper is structured as follows: the next section discusses the literature concerning the theoretical background of technology-driven innovation and cloud computing, technology adoption and SMEs. Then, research hypotheses and a conceptual model are outlined. The following section describes the research methodology used. Then the findings from the empirical research are obtained, followed by an in-depth discussion of the results. Finally, a conclusion and recommendations for future research are presented. The fundamentals for ensuring a successful adoption process of innovations is dependent on how organisations can identify the needs in adopting such technological innovations (Kim 2015; Swanson and Wang 2005; Yoo et al. 2012; Jahanmira and Cavadas 2018). As a result, top management needs to create the right environment to help in bringing about a tolerable conversion of the existing work practices and organisation operations (Ghobakhloo and Tang 2013; Thong, and Yap, C And Raman, K. 1997). Utilising digital innovations as critical drivers for change to improve the effectiveness of business functions and processes in organisations often face some apprehension given the concerns, potential consequences and impact to the working environment (Moore 2014; Irani et al. 2001). For small and medium enterprises (SMEs) this has not been an easy journey given the financial and human capital constraints, which SMEs are often faced with (Dibrell et al. 2008). Besides, often in SMEs, the owners/directors are the primary sources of the decision-making process concerning the introduction of new and innovative technology. Thus, realising how its benefit prevails the associated risks, they will be more inclined towards adopting new technological solutions (Jahanmira and Cavadas 2018; Yoo et al. 2012; Thong and Yap 1995). Interestingly, a number of studies have pointed out the challenge of adopting new technologies is due to not realising the associated benefits, understanding its appropriateness, poor planning, and limited customer engagement and retention plans (Levy et al. 2001; Bull 2003; Morgan et al. 2006; Nguyen et al. 2015). Technological change usually brings about social change. Generally, technological resistance is a challenge that is relatively easy to overcome by SMEs as it has long been acknowledged that SMEs and larger organisations are managed in different ways (Berthon et al. 2008). SMEs tend to have simpler structures in which the chief executive officer (CEO) makes and overlooks many of the day-to-day activities. Consequently, he/she has the authority to affect or pressure other components of the organisation and ultimately overcome any employee resistance to change (Caldeira and Ward 2003). In the context of cloud computing, there has been a growing trend as to whether or not the concept can be adopted as a mainstream technology by relatively larger SMEs (Sultan 2011). Despite the growth and presence of cloud computing technologies, some resistance by individual employees remains (Loukis et al. 2019; Redshift 2011). Further, recognising the role of the organisation in facilitating the adoption of innovative technologies is arguably vital. With the limited infrastructure, human capital and associated expertise existent within SMEs, the desired successful uptake of cloud computing technologies can be at stake (Bastos et al. 2017; Sultan 2011; Dholakia and Kshetri 2004). Moreover, from an organisational perspective, investing in a new innovative technology often creates complexities for organisations in rolling it out resulting in some reservations (Moore 2014; Schaupp and Carter 2010; Smith et al. 2007; Gonsalves 2005; Straub and Welke 1998). Due to the multifaceted nature of modern business operations, firms require considerable storage space in order to maintain large volumes of their collected data (Loukis et al. 2019; Bhargava and Sundaresan 2004). Over the years, this has resulted in cloud-computing infrastructure service providers such as IBM, and Salesforce.com to offer ‘pay-as-you-go’, on-demand services to externally host and manage essential business operations (Kaltenecker et al. 2015; Currie et al. 2004; Currie and Seltsikas 2001). Although promising to offer significant benefits to SMEs through virtual access to the latest enterprise systems at a fraction of the cost the adoption and diffusion of cloud computing services have been modest. Previous studies attribute this to high storage costs associated with external hosting (Senyo et al. 2018; Son et al. 2014; Currie et al. 2004). Nonetheless, in recent years affordability of storage costs has ignited interests in cloud computing technologies as an alternative to traditional web services (Loukis et al. 2019; Senyo et al. 2018; Sultan 2011). Also, by utilising this innovative technology as a vehicle for innovation to drive competitiveness, it has been argued that this can help in optimising available resources and associated capabilities more efficiently and effectively (Moore 2014; Yoo et al. 2012). For SMEs, cloud computing services offer some incentives by lowering the cost of entry, providing immediate access to hardware and software resources and providing a platform for innovation and scalability (Marston et al. 2011; Bouwman et al. 2005). Furthermore, the widespread use of hand-held computing devices such as tablets, and smartphones considered as right advocates towards accelerating the implementation of various cloud-computing solutions (Ross and Blumenstein 2013). As such, organisations were encouraged, including SMEs, to capitalise on this unique opportunity to further strengthen their collaborative networks and expand their operations to global markets with innovative ICT solutions (Ross and Blumenstein 2015). Furthermore, it has been quite evident that despite the limited financial resources for SMEs, their autonomy can help in facilitating the adoption of innovation in order to maintain the required agility to respond to changing environments and requirements (Ferneley and Bell 2006; Dutta and Evrard 1999). Hence, for cloud computing, embedding this as part of innovation practices for organisations can be argued to help in maintaining a more dynamic IT infrastructure investment strategy (Loukis et al. 2019; Iyer and Henderson 2010). Utilising a theoretical underpinning aimed at examining digital innovations in organisations requires careful considerations for the associated factors influencing the adoption process. In this regard, the extant literature verified that the technology-organisation-environment (TOE) framework (Tornatzky and Fleischer 1990) appears to be appropriate to examine the identified innovation dynamics influencing organisational adoption specifically for cloud computing solutions. In general, The TOE framework identifies three perspectives of the organisation’s adoption for innovative technologies. Such a framework includes a technological viewpoint, which focuses on understanding the role of the technologies and its relevance to the organisation. In the context of innovation dynamics, the issues will be mainly revolving around the issues related to the IT innovation Driven competitiveness (Porter 1990; Zhu et al. 2006a, 2006b, Ollo-López and Aramendía-Muneta 2012) and its capabilities (Jia et al. 2017; Salleh et al. 2017; Nguyen et al. 2015; Hsu 2013). For the organisational dimension, it refers to related issues surrounding the organisation’s hierarchy, structure and managerial perspective. Therefore, for an innovation perspective, organisations attempt to pay much attention towards the risks in investing in such innovations (Gao et al. 2012; Schaupp and Carter 2010; Sarin et al. 2003, Lee and Allaway 2002,). At the same time, maintaining the required innovative practices in order facilitate the adoption process (Wamba and Carter 2013; Kunz et al. 2011; Michaelidou et al. 2011; Wang and Ahmed 2004; Agarwal and Prasad 1998). Finally, with regard to the environment in which organisations conduct their business, compete as well as adhere to the government rules and policies creating pressures which often result in creating barriers for the organisation to facilitate the process of adoption (Segarra-Blasco et al. 2008; Buehrer et al. 2005; Hadjimanolis 2003). Therefore, with new innovative technologies, the challenge can be entirely dependent on the responses organisations acknowledging such barriers within their business environment (Michaelidou et al. 2011; Iacovou et al. 1995). Nonetheless, limited consideration has been offered towards realising various organisational challenges associated with the role of innovation dynamics in facilitating the adoption of innovative technologies in organisations. The extant literature on TOE often focused heavily on examining the technological dimension of TOE while paying little attention towards other aspects of the framework (Kuan and Chau 2001; Gibbs and Kraemer 2004; Pan and Jang 2008; Yang et al. 2015). Drawing on the above discussions, utilising TOE framework to explore the influence of innovation dynamics for innovative technologies adoption in organisations appears to be relevant for this study. Overall, after reviewing TOE theoretical framework underpinnings and associated empirical evidence, the authors argue that this framework has a substantial significance to be utilised within this study despite the variations in the identified measures within the other contexts. Given SMEs often have limited resources (both financial and human capital) to explore new innovative technologies (Dibrell et al. 2008) the successful adoption of cloud computing solutions appears to be a perfect match to verify the related innovation dynamics determinants. For SMEs, Kotelnikov (2007) noted that not all organisations need to use IS/IT to the same degree of complexity. SMEs may adopt these tools progressively or jump immediately to advanced IT capabilities. In other words, it may not even be necessary for some types of organisations to store data in the ‘cloud’. Despite this, it is argued by Kevany (2010) that cloud computing applications are increasingly being taken up by organisations as their benefits far outweigh the costs. In addition, Loukis et al. (2019), Petrakou et al. (2011) and Nair et al. (2010) emphasised on how moving into the ‘cloud’ does help in reducing expenditure, enhance the organisation’s agility, maintain a faster return on investment, eliminate market entry obstacles, and provide a robust business infrastructure, leading towards business continuity and sustainability. Smith (2009) emphasises that since the computing hardware does not reside in the organisation facility but in a data centre in a different location, there are less in-house IT staffing costs and overheads that are incurred. Reduced costs are therefore a significant advantage. Other motivations why organisations adopt cloud computing technologies are that they enable rapid deployment, improved scalability, flexibility and the ability to support business objectives of the organisation (Feuerlicht et al. 2011). Therefore, from SMEs perspective, these features enable organisations to stay focused on their core competencies and bring products to market more quickly by benefiting from access to the same level of infrastructure that larger competitors use (Martin 2010). Interestingly, previous technology adoption studies have been published in the context of SMEs (see Mehrtens et al. 2001; Bruque and Moyano 2007; Sykes et al. 2009; Wu and Lederer 2009; Weiyin et al. 2011). These attempted to explore the individual/employee perspective rather than focus on the organisation’s angle specifically in consideration of innovative approaches and solutions. In this regard, many of these studies focused on utilising traditional adoption theories including various technology adoption models, including TAM, TBP and TRA models, which focuses on individual/users perceptive on technology adoption (El-Haddadeh et al. 2019) which is beyond the scope of this study. Nonetheless, the literature reveals how organisations and SMEs in particular, need to recognise their role in facilitating the adoption of innovation within, and how this should be carefully aligned with the conventional technology adoption process. In this respect, for SMEs, harnessing an innovation environment that is equipped with technical knowledge and associated resources can offer the required agility to adapt to new business demands (Ferneley and Bell 2006; Grant 1991; Ross et al. 1996; Sultan 2011). SMEs often need to carefully realise the adoption of innovative and disruptive technologies given the organisation dynamics can significantly be affected by such change (Smith et al. 2007; Nguyen et al. 2015). Hence, the present study examines the main three dimensions associated with the TOE framework as depicted in the proposed research model in Fig. 1. In order to test the research model and hypothesis proposed in this research, the author used a questionnaire that was prepared based on a comprehensive literature review of IS/IT adoption, innovation and cloud computing (Davis 1989; Gefen et al. 2003; Belanger and Carter 2008; Sharma et al. 2010; Hadjimanolis 2003; Siamagka et al. 2015; Nguyen et al. 2015; Hsu 2013; Low and Chen 2011). The questions were modified and edited based on the unique characteristics of innovation in organisations with a specific focus on cloud computing. Since the nature of this study is explanatory, different measurement items which were closely related were used to explore and capture comprehensive concepts of adoption. A pre-test of the developed questionnaire was done using five academic peers to assess the validity of the questions in term of sentencing, phrasing and conception. After receiving the comments, suggested amendments were made (Miles and And Huberman 1994). By doing so, this helped to eliminate and identify redundancies in the questionnaire structure/design before it is sent to the target sample. At the same time, this helped to check for the relevancy and clarity of the questions. Finally, six independent variables: Perceived Innovation Barriers, Perceived Innovation Risks, IT innovation Driven competitiveness, Organizational Innovativeness and Innovative IT Capabilities with 22 measuring items were selected (shown in Appendix A). A representative sample is required to make conclusions about the whole population (Zikmund, 2002). To overcome method bias, we distributed the questionnaire following two procedures: paper-based questionnaires handed out personally and an online web-based survey. The UK context was selected for this study due to the sharp rise in the number of SMEs adopting cloud computing technology and related services. European Union (EU) categorises SMEs into micro, small and medium-sized enterprises (SMEs) that employs fewer than 250 persons and have an annual turnover that does not exceed 50 million euro (European Commission 2005). To distribute the survey questionnaire developed in the study, SMEs in the Greater London area, UK - were targeted. These SMEs represented various service sectors including; IT, retail, and health. The paper-based survey questionnaire was distributed to targeted IT managers and other senior managers at their office premises. As a result, This enabled the participants to understand the importance of the research and recognise the presence of the researcher, which according to Heje et al. (2006) can encourage a higher response rate. The targeted organisations have utilised some cloud computing solutions including Salesforce CRM, Google Apps, Basecamp, and Claranet. The paper-based questionnaires were given out to the participants at the start of the day and collected in the evening of the same day. In total, 122 valid responses were collected from these organisations. Besides, since it was sometimes deemed not feasible to physically access other SMEs in the region due to cost and scope constraints, online social media tools were utilised to gain access to other SMEs in order to obtain further responses. By utilising online questionnaires, as suggested by Wright (2006), the author was able to target further SMEs across the targeted region. To gain access to measurable data, electronic questionnaires were executed on Google Docs. This free web-based tool allowed questionnaire answers to be received in real-time reducing the turnaround time, cost and non-response errors (Blumberg et al. 2008). These electronic questionnaires were made available on the social media outlets for three weeks, and reminders were sent to encourage a higher response rate. As a result, a further 116 employees from other SMEs responded. Given the broad range of organisations targeted for this study, the survey sample is considered adequate and justifiable for investigating the innovation-related factors influencing organisations’ adoption of cloud computing in SMEs. The total number of responses gained from the paper and online questionnaires was 238 (122 paper-based and 116 electronic). The answers from the paper and online questionnaires were collated, coded and keyed into SPSS before analysis was carried out. Where there were negatively phrased scale items (to avoid response bias), the points were given in the reverse order (Barnette 2000). To ensure the reliability and validity of all variables in the model, the survey instruments were based on the results of the previous studies. All of the constructs were measured using a seven-point Likert scale anchored at 1 = strongly disagree, and 7 = strongly agree. Appendix 1 shows the survey instruments and their sources. This study utilised Structural Equation Modelling (SEM) technique in Analysis of Moment Structures (AMOS) to validate the hypotheses and the performance of the proposed conceptual model. It helps to test the hypothesised model statistically in a simultaneous analysis of the entire system of variables to determine the extent to which it is consistent with the data. SEM was considered for this study since it fits the purpose of testing the hypotheses that involve multiple regression analysis among a group of dependent and independent variables (Hair et al. 2010). From a descriptive analysis of demographic information, it has been revealed that out of the total received 238 responses, 58% were male and 42% were female. The age of the respondents had a normal distribution with a slight left skew. 69% of the respondents were aged between 30 and 39 years old. These demographic properties are representative of the population characteristics engaged in cloud computing management related functions. Furthermore, Table 1 provides further description of the sample detailing the various cloud computing services and employees’ job functionality. The survey details that IT and senior managers within these SMEs are actively engaging with various activities at the operational level. As such, this conforms with the relevant literature on SMEs which highlights that majority senior managers and managing directors are directly involved in various activities within their respective organisation at all levels including operational, management and strategy. Table 2 presents the mean and standard deviation for all the items. All items were rated on a seven-point Likert scale with a score of 7 indicating strongly agree and a score of 1 indicating strong disagree. The mean score for all items of the constructs shows a mean of higher than the neutral point (4) which points out that respondents mostly agreed with the items. Table 2 also shows that the Cronbach’s alpha for all the constructs is above 0.76, confirming that the data is highly reliable and there is internal consistency of the scales. Cronbach’s alpha with a figure of ≤0.90 is considered excellent reliability, 0.70–0.90 is considered high reliability, 0.50–.70 is moderate reliability, and ≤ 0.50 is low reliability (Hinton et al. 2004). The measurement model was tested using Confirmatory factor analysis. As suggested by Hair et al. (2006), this study has validated its confirmatory factor analysis through two stages: (1) goodness of fit indices and (2) Construct Validity. To conduct the first stage, this study has used 7 goodness of fit indices (Hair et al. 2010), Chi-square to (X2) to the degree of freedom (Df), goodness of fit index (GFI), adjusted goodness of fit index (AGFI), incremental fit index (IFI), Tucker-Lewis Index (TLI), comparative fit index (CFI), and root mean square error of approximation (RMSEA). The fit statistics are reported in Table 3. The table indicates that all the figures illustrate a good fit for the measurement model. X2/df has achieved an acceptable fit of 1.341 and is well above the minimum requirement of (1:3). The results for GFI, IFI, TLI, CFI were 0.929, 0.988, 0.985, 0.988 respectively and all were above the recommended value of ≥0.90. The results for AGFI indicated a figure of 0.903, which met the recommended criteria of ≥ in 0.80. RMSEA has also met the recommended criteria of <0.80 and achieved an acceptable figure of 0.039. For the second stage, this study has validated the CFA results through convergent and discriminant validity. The construct validity statistics are reported in Table 4. Convergent validity is assessed by average variance extracted and composite reliability, and the rule of thumb is that AVE value should be higher than 0.5, and composite Reliability should be greater than 0.70 (Bagozzi and Yi 1988). The results of this study indicate a high level of convergent validity for all the latent constructs used in the measurement model. The results show a significant level of discriminant validity, as AVE is higher than the squared correlation estimate for all the constructs (Table 5). After establishing the goodness of fit for the structural model, the research hypotheses were tested by analysing the path significance of each relationship. Table 6 presents the results of the path estimates in which four hypotheses were supported, and one is rejected. Path estimates were tested using standardised estimate, critical ratios (t-value) and p value. A relationship is deemed to be significant when a t-value is above 1.96, and a p value is ≤0.05. From the proposed model, the results revealed that organisational innovativeness and innovation capabilities have a positive impact on use with path coefficients of 0.31 and 0.27 respectively, thus supporting H1 and H4. Additionally, the results indicate that innovation perceived barriers, and innovation perceived risks have a negative impact on use with path coefficients of −0.21 and − 0.38 respectively, thus supporting H2 and H3. On the other hand, IT innovation-driven competitiveness has a limited impact on use with a path coefficient of 0.02 and thus rejecting H5. Overall, the path coefficients figures supported four hypotheses (H1, H2, H3, and H4) and rejected H5. Results from the empirical findings reveal that while risks and barriers are often associated with the adoption of innovative technologies by SEMs, organisational innovativeness and associated capabilities can also play a central role in this. Based on the findings, we can evaluate the potential significance of this revelation. For organisational innovativeness and innovation capabilities, the factor loading for all items of both factors on the adoption of innovative cloud computing technologies has been noted to be above 0.7. This indicates that a positive unit change on organisational innovativeness and capabilities causes at least 0.7 unit positive change on adoption when all other factors remain constant. A strong effect of both organisational innovativeness and capabilities on adoption suggests that the more SMEs maintain an encouraging innovative environment equipped with the right and relevant, innovative capabilities the more likely they will use cloud computing technologies. In SMEs, capabilities need to be nurtured to ensure a successful uptake of innovative technologies. By doing so, cloud computing technologies will be guaranteed to succeed (Dholakia and Kshetri 2004). With regard to perceived barriers and risks associated with innovative cloud computing services adoption, the questions in the survey attempted to obtain IT managers’ perspectives on these two issues. The results revealed that decision makers in SMEs do acknowledge the risks and existing barriers in affecting the adoption process of innovative technologies. In this context, the factor loading for all associated items of both constructs on the adoption of innovative cloud computing technologies has been noted to be above 0.8. This reveals the apprehension towards the risks and barriers towards the adoption process. Thus, this suggests that SMEs are taking into consideration the negative impacts of using new innovative technologies such as cloud computing applications and services. The literature reveals how perceived risks of information technology, and in particular innovative ones, are intertwined with concerns related to ensuring systems are secured from any complications (Schaupp and Carter 2010; Gonsalves 2005); Straub and Welke 1998). As a result, SMEs avoid utilising innovation or technology as part of their working practice. Similarly, for innovation barriers, studies verified how SMEs with their limited resources, often financial and expertise, can negatively influence the process of adopting cloud computing applications services (Bastos et al. 2017; Walczuch et al. 2000; Thong and Yap 1995; Weerd et al. 2016; Erisman 2013). On the other hand, the findings suggested that the impact of IT innovation-driven competitiveness appeared to be insignificant as it did not have a direct impact on the adoption process. While previous studies highlighted the importance for SMEs utilising technology, including cloud computing, as an anchor for innovation to drive competitiveness given its abilities in overcoming financial burden (Marston et al. 2011; Bouwman et al. 2005), conceivably for this study this appears to be less prominent in this process. Indeed, further research could explore such a relationship further with regard to engaging with other SMEs beyond the selected sample of greater London as well as other innovative technologies. Finally, with regard to the dependent factor proposed as a determinant of cloud computing adoption, the findings revealed that it is statistically significant. This is consistent with existing studies that empirically tested and confirmed prior technology adoption models and frameworks; specifically on the topic of e-commerce adoption by SMEs (e.g. Grandon and Pearson 2004). Based on the findings of the structured model, the positive significant cause-effect relations between the proposed organisational innovations related factors in this study suggest that the organisation has adopted cloud computing. Overall, this study offers new insights on understanding the associated opportunities and challenges for SMEs regarding innovative technologies adoption. The findings reveal how organisational innovativeness and innovative capabilities play a significant role in facilitating the adoption process for innovative technologies. For SMEs, harnessing an innovation environment that is equipped with technical knowledge and associated resources offer the required agility to adapt to new business demands (Ferneley and Bell 2006; Grant 1991; Ross et al. 1996; Sultan 2011). It also highlights the influence of perceived risks and barriers in impeding the adoption process of cloud computing technologies. It is evident that with the limited financial and human resources; SMEs often need to carefully realise the adoption of innovative and disruptive technologies given the organisation dynamics will significantly be affected with such change (Smith et al. 2007; Nguyen et al. 2015). Lastly, this study demonstrates how recognising the role of the organisation in facilitating the adoption of innovation within needs to be sensibly aligned with the traditional technology adoption process. By doing so, this will offer SMEs the opportunity to understand better the needed steps required towards successfully adopting new innovative technologies such as cloud computing. As such, this research has demonstrated that understating innovation dynamics for SMEs can play a significant role in facilitating the adoption process for innovative technologies helping organisations to sustain their business models and maintain the required competitive advantage. 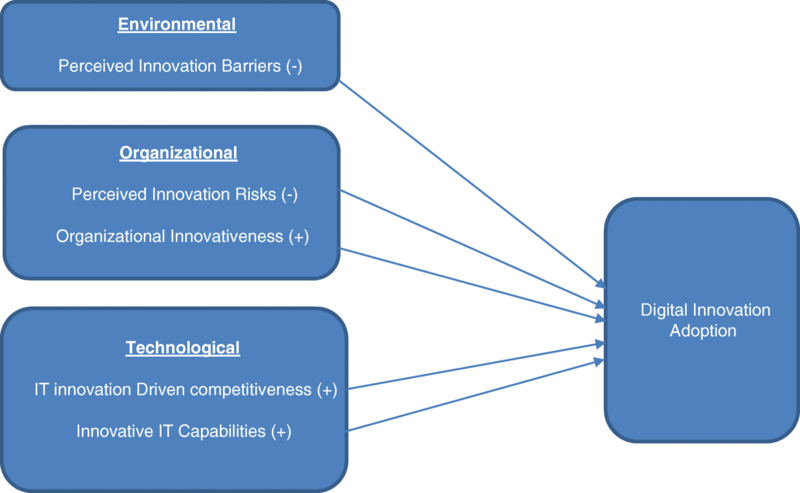 The orientation of innovation dynamics for the related innovative technologies with their strategic perspectives has been a continuous challenge for many organisations (Levy et al. 2001; Mckeen and Smith 2003; Smith et al. 2007; Nguyen et al. 2015). It is clear that innovative cloud computing technologies offer a cost-effective mechanism for SMEs to leverage the business value of their information systems and technology (Morgan et al. 2006; Ross, 2015). SMEs need to ensure they invest in technology that is trustworthy and that the environment is set to fully appreciate the adoption and use of this technology without intricacy. As such, this can help in promoting organisational innovativeness that is equipped with the right capabilities while carefully realising the risks and associated barriers in order to facilitate the adoption process. By doing so, SMEs can maintain their business continuity and sustainability. This study presents several implications. It provides useful insights into the knowledge gap in understanding innovative technologies adoption amongst SMEs. The implications of the study are multiple, and in summary, we can articulate that findings of this research will provide managers of SMEs a better understanding of what factors associated with innovation can influence the adoption of new technologies in their organisation. In particular, from an academic perspective, the study makes a valuable contribution in advancing the understanding of organisational perceptions associated with utilising innovative technologies. In this regard, this study has sought to introduce and examine a model that hypothesises the effects of technological, organisational, environmental and managerial characteristics on Innovation dynamics for cloud computing technology adoption within SMEs. This research has shed new light on how organisations require careful considerations in their perusing of new innovative technologies. Furthermore, the findings confirm that innovative technologies such as cloud computing offers organisations the opportunity to sustain their competitive advantage. For SMEs, their success is built on utilising the right business model by offering the right products and services to attract new customers as well as retaining those existing ones (Ruokolainen and Aarikka-Stenroos 2016). On the other hand, from a practitioners perspective, the findings suggest that vendors of such technologies responsible for providing applications to SMEs should be more engaged to help in understanding the needs of SMEs. At the same time, SMEs also have to increase their effort to create the right environment regarding the potential benefits of using innovative solutions and applications as in cloud computing. There is no doubt that innovative technologies will offer SMEs economies of scale in using the latest software and enterprise systems allowing them to compete on an equal footing to larger competitors. In this respect, the empirical results concur that SMEs must be capable of adopting and adapting such innovative technologies by continuously upgrading themselves, and staying ahead of change by learning and re-learning. These efforts should focus not only at a senior level and middle management but also at an operational level amongst employees. SMEs are a significant part of the UK’s economy, and as a result, the findings of this research may have an impact on SMEs corporate strategy on the adoption of innovative technologies. The findings also offer vendors of innovative technologies an idea of how technological based applications can be improved to aid the rate of adoption by SMEs further. From this study and findings, managers of SMEs can draw valuable practical insights into implementing innovative technologies projects. It is evident that immediate adoption of innovative technologies, specifically cloud computing, by SMEs can enhance performance, facilitate innovation and enhance performance. Like other studies, this research has some limitations. The survey sample covered SMEs within a geographically small region in the UK. This may limit the generalisability of the findings and may not be taking into account the different and broader industry contexts as well as the level of digitisation that exists in the SMEs before their move towards innovative technologies. This has been countered to a certain degree by the online questionnaires made available to many SMEs where there was a reliance on individuals promoting them within their networks. In this respect, future research should aim to target multiple SMEs in different industries, and a cross-comparison of adoption should be done. Also, the unit of analysis of this study was not focused on the adoption of cloud computing at the employee level, but rather at the organisational level of SMEs towards technological innovation. Therefore, examining the role of employees in the adoption of innovative technologies can help in offering further understanding specifically in the context of cloud computing technologies. While this study did not examine the adoption of technological specifics for cloud computing services (i.e. infrastructure, platform, and software), further research can focus on examining these innovative services independently. Generalisations from this research should be made with caution. Although the number of 238 active respondents is a relatively good sample size given the scope for this research, any size more than 500 would have been ideal to carry out and draw a conclusion from SME related research. It may also be slightly biased towards SMEs that have more than 75–100 employees, and in this context, this study may not adequately reflect SMEs that have a much lower number (e.g. less than 10) of employees. While this is a modest contribution to IS/IT adoption knowledge, this study has nevertheless addressed a real research gap that exists in the IS/IT literature about the emerging paradigm of innovative technologies specifically related to cloud computing. Future research should aim to provide a more integrative model that encapsulates a more significant number of crucial adoption drivers and predictors as well as other innovative technologies. Open Access funding provided by the Qatar University. El-Haddadeh, R., Weerakkody, V., Osmani, M., Thakker, D., & Kapoor, K. K. (2019). Examining citizens’ perceived value of internet of things technologies in facilitating public sector services engagement. Government Information Quarterly, 36(2), 310–320. https://doi.org/10.1016/j.giq.2018.09.009. European Commission (2005), The new SME definition User guide and model declaration, Enterprise And Industry Publications, http://ec.europa.eu/enterprise/policies/sme/index_en.htm. Kotelnikov, V. (2007). Small and medium enterprises and ICT. Available at: http://www.apdip.net/publications/iespprimers/eprimer-sme.pdf [accessed 16th November 2015]. Martin, J. (2010). Should you move your small business to the cloud? Available at: http://www.pcworld.com/businesscenter/article/188173/should_you_move_your_small_business_to_the_cloud.html [accessed 15th January 2017]. Redshift (2011). Adoption, Approaches & Attitudes: The Future of Cloud Computing in the Public and Private Sectors. http://www.amd.com/us/Documents/Cloud-Adoption-Approaches-and-Attitudes-Research-Report.pdf (accessed on: 18 May 2015). Wamba, F., & Carter, L. (2013). Twitter adoption and use by SMEs: An empirical study. 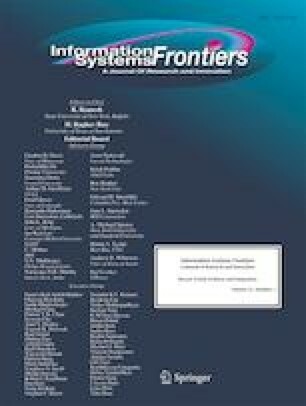 Maui, Hawaii: The 46th Hawaii international conferences on system sciences (HICSS) (January 7-10, 2013. Available at SSRN: http://ssrn.com/abstract=2137479 [accessed: 10 may 2017]).